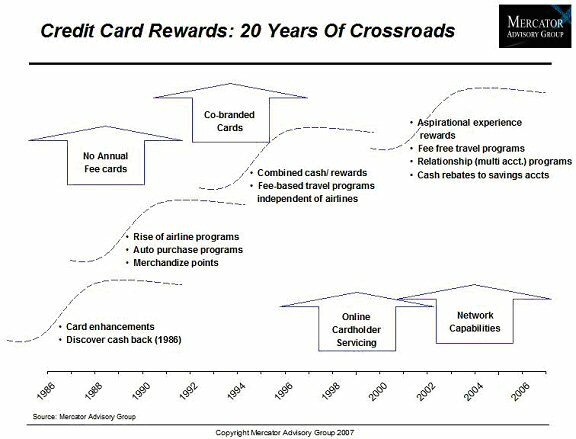 This individual Report Credit Card Rewards: Another Day, Another Crossroads is available for purchase. This Report is available to members of Mercator Advisory Group’s Credit Advisory Service. Please be advised that this Report is normally part of a research and advisory service that provides ongoing support throughout the year. As such, this Report contains significant depth of content that is selected for its strategic importance to our members. (For a description of these services, see our Advisory Services section). Today's realignment in credit card rewards programs is an economic necessity, but just another iteration in ongoing program development. Efforts to scale-back rewards programs, however necessary from an economic standpoint, will take some heat due to raised consumer expectations. New rewards tools for issuers include turnkey rewards programs, cross-product relationship rewards, and consumer-directed features. Cash back is undergoing a renaissance in rewards programs, with new earning and disbursement features. High-value targeted discount programs are increasingly linked to rewards. Availability of turnkey rewards programs for issuers who could not otherwise afford (or who can no longer afford) a competitive proprietary program. Developments of relationship-based rewards programs, which can incent usage of a broad array of a bank's products, encourage pooling of individual relationships, or even involve marketing partner firms. Evolution of consumer-directed features which engage the consumer in managing the rewards program to meet their own segment needs. Ken Paterson, Director of the Credit Advisory Service at Mercator Advisory Group and the author of this report comments that, "what is especially interesting is that industry accounts have focused on rewards realignment as an industry-changing and uncommon occurrence. APR's and credit terms change all the time; but consumers may actually pay more attention to rewards. Of course, rewards programs are designed to both attract and retain customers, so any re-alignment that jeopardizes retention runs a real business risk. But in this competitive environment, reports of the death of credit card rewards have definitely been exaggerated".